Divorce. While nobody likes to consider this process, the reality is that a majority of couples will separate in their lifetime. Beyond the statistics of what is normal, it’s important to remember that every situation is unique, and every individual has their own reasons for coming to to this decision. The divorce process can be long and complex, making it vital for anyone in need of representation to seek out a local family lawyer for assistance. 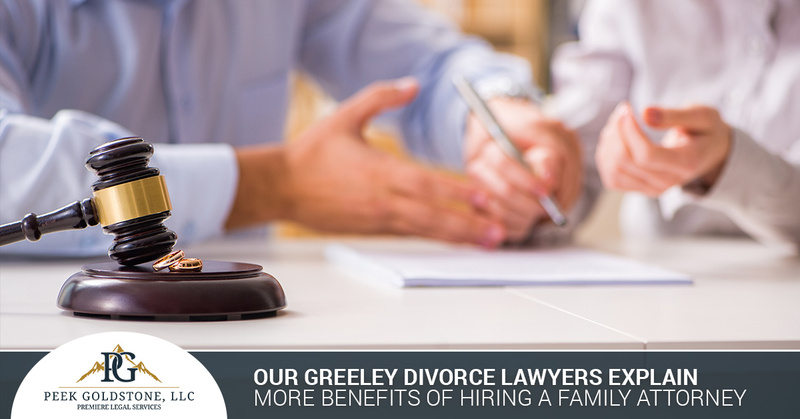 Colorado residents looking for a divorce attorney in Erie or Greeley for assistance can benefit from contacting Peek Goldstone, LLC for assistance. Our law firm has the training and extensive experience needed to deliver premier representation throughout your divorce process. Hiring a divorce lawyer is never fun, but doing so can provide a plethora of benefits throughout this difficult process. Today, we’ll continue to highlight the advantages of hiring a divorce lawyer, as well as the value that our team can provide for your case. Be sure to contact us today for complete assistance. Proper planning and preparedness are essential for any court proceedings, so be sure to consult with a family attorney well before heading to your first hearing. Not only will our divorce attorneys have the knowledge and skills to provide professional guidance through this journey, but they can also help you to find the most optimal resolution for your case. In many cases, a divorce lawyer will be able to offer options that you may not have been aware of. It can help many people to think of divorce as a risky venture, where one or both individuals can end up displeased with the outcome. You and your spouse may be able to resolve your issues through one of numerous different alternatives. Peek Goldstone is here and always ready to help, so be sure to call us today to learn about our approach to divorce cases. Family can be complex, making it highly beneficial to seek out the help of professionals to keep your documents and paperwork in order. Every situation is unique, requiring different forms to move your case forward. Individuals hoping to take on the separation process themselves often find themselves buried under complicated forms. As we mentioned in our previous blog post, the judge will not treat self-represented adults much differently from family lawyers, and will expect you to be organized and thorough when you submit paperwork. In many cases, a complete file full of all of the necessary forms will do much to make your case look better for you in the eyes of the court. Failing to submit all of the forms needed can cause a lot of undue stress during this emotional time, so be sure to reach out to our divorce attorneys in Erie or Greeley for assistance in handling the technical work. Ultimately, the purpose of hiring a family lawyer is to create the most positive possible outcome for your case. You will likely be focused on winning the decision and gaining what you feel is right throughout the process, but our divorce attorneys will be focusing on achieving an optimal resolution. In many cases, litigants will be offered agreements that can benefit both parties. Our team is focused on the big picture, and we know how small decisions now can result in big changes later on. Our local lawyers understand when certain aspects are worth fighting for, and will work with you to ensure that you are taking the correct steps for success. Instead of spending a lot of time, money, and resources on certain points, we may prioritize the most vital points to enhance your chances for success. Peek Goldstone is here to deliver complete support throughout your divorce process. Our Erie and Greeley-based divorce attorneys have the skills and experience to provide complete support for you through this difficult time, and we are trained to find optimal resolutions for everyone involved. Contact us today to learn more.